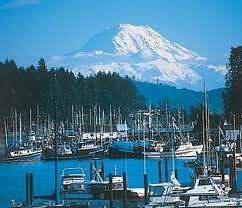 Gig Harbor is a beautiful coastal city on the far south side of Puget Sound. A part of the Tacoma metro area it is also within commuter range of Seattle, making Gig Harbor a popular place for home buyers and real estate investors. In the early days it was a center for logging operations, commercial fishing, and boat building. Many family homes were built in the town once the first bridge connected Gig Harbor to Tacoma. Today it remains very affordable with the median home price around 250,000, and Gig Harbor has also become a tourist draw. The current real estate market shows many foreclosure, also known as bank owned homes in Gig Harbor. Investors, bargain hunters, and first time buyers are all interested in these properties. Buyers are finding that using our search site helps them find fixers, learn about short sales, and prepare to buy a bank owned home. Buyers interested in Gig Harbor Washington homes for sale will find a wide range of available properties There are a wide variety of condos and homes for sale currently listed in the Gig Harbor real estate market in a variety of sizes, styles and price range. For quick and accurate searches go To www.PiercePowerSearch.com which has detailed information on hundreds of homes for sale in the Gig Harbor area. North Gig Harbor has a small, maritime city feel. with miles of waterfront and retaining much of its small town charm. Visitors and residents alike enjoy the many shops, restaurants and activities located on the waterfront with great views of the harbor and Mt. Rainier. For information on hundreds of homes and Condos for sale in the North Gig Harbor Area use our search tools to quickly narrow your search! Buying a home is a very important decision. Everybody has a different set of features that they are looking for. Some are looking for family homes for sale that have a certain number of baths and bedrooms and are in a particular neighborhood. Others are searching for luxury condos in an urban setting. And some are looking for a second home or vacation place where they can relax on the weekend. No matter what kind of property that you are looking for, We can help you find what you are looking for fast. Many people want to buy a house in a specially designed community. If security is an important consideration there are Gig Harbor homes in gated communities. If you’re interested in living on the waterfront, Gig Harbor is a great place to seek homes for sale. Search the PiercePowerSearch engine and it will return all open listings of homes for sale in Gig Harbor. For most people, the proximity to work will have an influence on where they choose to live. They are mainly interested in condos and homes for sale that are close to their place of business. PiercePowerSearch has a great interactive map that covers the entire Gig Harbor real estate market. This allows buyers to search for Gig Harbor homes or sale along their own commuter routes or near other features such as recreation, schools, parks etc. The map tool goes to street level, and is extremely accurate. Anyone interested in buying a Gig Harbor home will find our website to be a great resource. It allows buyers to search all listings in western Washington using whatever features that interest them most. Users can specify price ranges or even a specific price. Buyers can make their search as general or as specific as they want. When ready to buy the site also has information on financing and Agents who are experts in the Gig Harbor real estate market. You will find www.PiercePowerSearch.com is a great place to start your search for Gig Harbor homes.